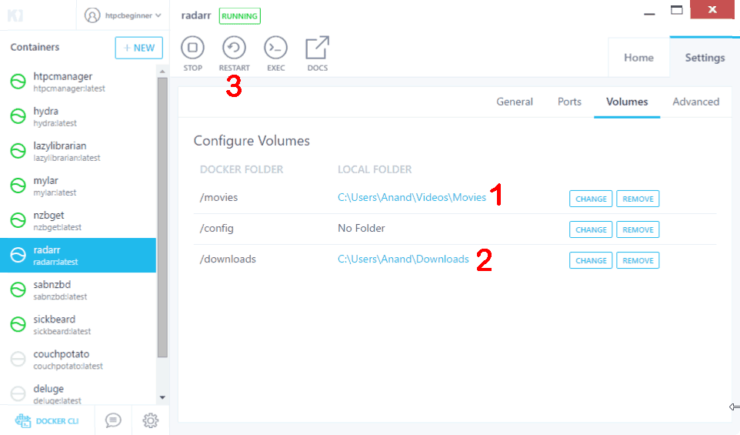 Home Home Server How to Install Radarr on Docker using Kitematic GUI? We already shown how to install Radarr on Docker commandline, which works on all platforms: Windows, Linux, and Mac. Radarr is an automated movie downloader like CouchPotato. For people who don't prefer commandline, we presented Kitematic Docker GUI for Windows. In this post, I will show you how simple it is to install Radarr on Docker using Kitematic GUI for Docker engine. Unfortunately, at this point, there is no Kitematic like tool for non-Windows environment. Therefore, you can only install Radarr using Kitematic on Windows systems. If you still do not know about Docker, I strongly recommend our guides on what is Docker and its installation on Windows and Ubuntu. 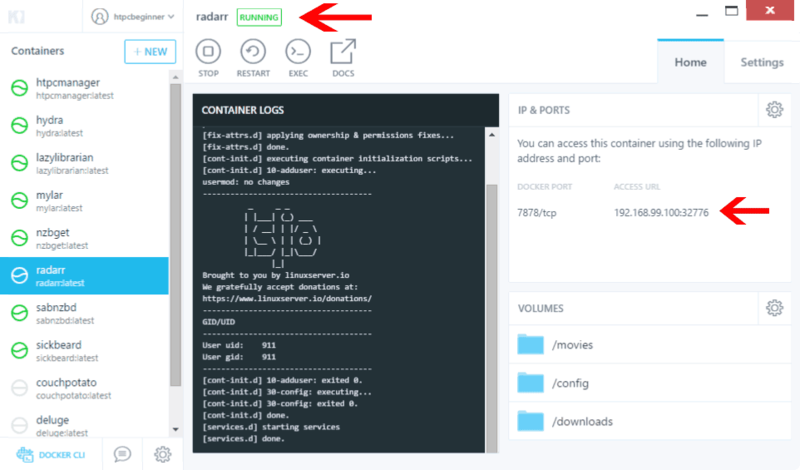 In short, Docker allows installing home server apps such as Radarr as self-contained containers, making it easy to install and manage them. No complicated Radarr setup procedures. So, without further ado let's see how to install Radarr using Kitematic Docker GUI. 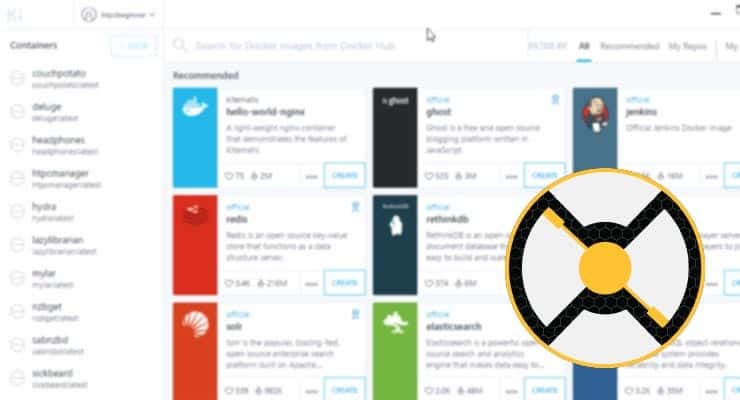 Once Kitematic is open and connected to your Docker engine. Search for “Linuxserver Radarr” in the search box as shown in the picture below. Once your figure out which Radarr container image you want to use (in this case LinuxServer's), hit the “Create” button as shown in the picture above to install Radarr on Docker. The Radarr container image will start to download as shown below. 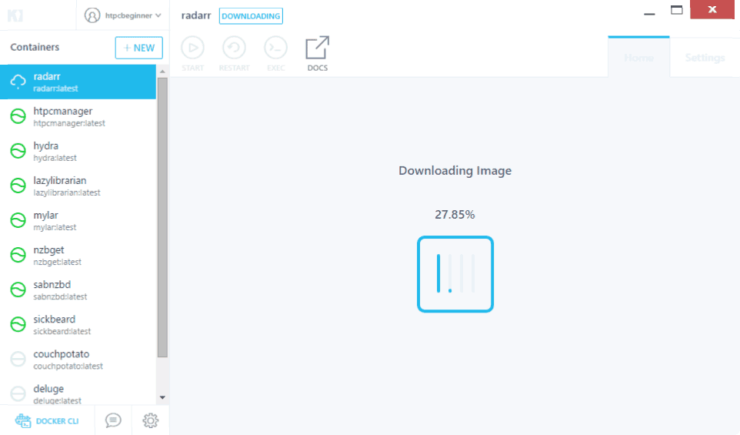 Once Radarr Docker Hub container image is downloaded, Kitematic will use the image to create a new container with Radarr. Wait for the container setup to complete. When done, you will see the “RUNNING” status and the Radarr access URL and port, as shown in the picture above. You want Radarr to be able to download Movies and move them to correct folder. By default, Docker containers will save any data in the containers folder in C Drive and Radarr won't have access to folders outside that. This may or may not be the right place or have enough space, depending on your situation. But the chances are you have a specific download folder and a Movies folder. Hit the “CHANGE” button and setup the path for “downloads” (where Radarr downloads content) folder and “movies” (where the movies are finally moved to and organized) folder, as shown below. Do not setup a folder for “config” as this often leads to Radarr database corruption. Once done, hit “RESTART” for the new settings to take effect. Before accessing Radarr, I recommend changing MAC IP:PORT. Under Settings -> Ports for the Radarr container, you can change the access port to the default port number or anything of your liking. If I let Docker decide the port number, I noticed that sometimes the container does not start, possibly due to port conflicts. While manually changing, if you choose a port number that is already being used by another service, Kitematic will notify you. You will then have to choose a different port number. In this case, I set the MAC IP:PORT for Radarr to 7878. This allows you to set port forwarding on your router and access Access Radarr on Browser from outside your home network. Make sure to restart your container after making the port change. You may then access Radarr on your web browser using the URL or Link displayed in the “Home” tab or under “Ports”. If Radarr opens up in your browser as shown above, you are all set. Notice how much more simple it is to setup Radarr using Kitematic than commandline? Now you can go ahead add Movies that you want and start enjoying them on your media center. If you do not like Radarr, you may try installing CouchPotato instead. Sounds exciting? Go ahead install Radarr on Docker using Kitematic GUI and make your home server better.